Whether you’re young, old or somewhere in between, you can’t deny – waterslides are ruddy good fun; so fun in fact, they’re often added to cruise ships in a bid to maximise the on-board fun factor for plucky young bathers. In homage to the humble water slide, here’s our pick of 11 of the best cruise flumes on the high seas. Winding 100ft from the top of latest Quantum-class ship, Harmony of the Seas; let it be said that The Ultimate Abyss isn’t for the faint of heart. This monstrous flume takes brave bathers on a ten-storey thrill-ride from the Sports Zone to the Boardwalk gardens below. If you’ve recently gorged at the all-you-can-eat buffet, it’s perhaps best you give Carnival Magic’s Twister a miss. Snaking hither and thither above the deck of both Carnival Magic and Dream, Twister is as thrilling as it is vertigo-inducing. Reserved for pint-sized paddlers only, Radiance Slide will have your youngsters in fits of giggles when they reach the plunge pool at the bottom. With twists and turns aplenty, this is one for any courageous little’uns looking to make a splash. Speaking of vertigo, that brings us to our next favourite flume – Vertigo. Featuring swathes of entirely translucent tubing, Vertigo is a beloved slide that’s been keeping MSC Preziosa’s passengers’ pulses racing since its construction. Line Whip may sound painful, but it really isn’t – unless of course you’re prone to motion sickness, in which case you should probably stick to the deckchair. Featuring two slides which coil around each other as they make their descent to the deck below, Line Whip is a much-loved Norwegian Cruise Line favourite. Carnival Cruise Line’s water slide division will have had no difficulties naming this particular slide, which features a peculiar bowl that can only be described as toilet-like. After travelling along a regular stretch of slide piping, riders will find themselves whizzing around an open-top bowl – in full view of waiting sliders above. Epic Plunge – the name alone radiates fun and frolics. As above, this gnarly slide features an open-top bowl, as well as ample enclosed piping that’s sure to set pulses racing. Take a seat aboard your Donald Duck embellished dingy for a trip down AquaDuck – the piece de resistance of Disney’s at-sea waterslide. Thanks to translucent tubing and reasonably slow descent speeds, AquaDuck grants grown-up cruisers excellent views over the ship below. 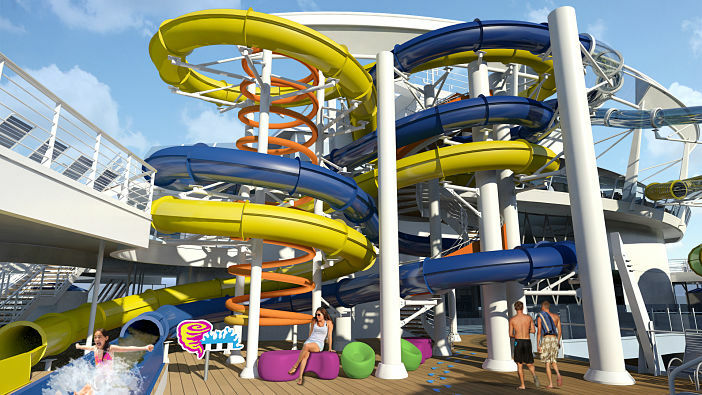 With its near-vertical drop, g-inducing bends and a unique drop-floor mechanism, Free Fall is the crème de la crème of extreme at sea waterslides. Rising tall above Norwegian Breakaway, this adrenaline-pumping ride is for big kids only. Do you harbour a competitive streak that’s yet to rear its head since starting the cruise? If so, pick a family member and head to Speedway Splash – a two-tube racing slide that pits bathers against one another in a high-octane waterslide Royale. Browse our complete range of Australian cruise deals or call 1300 857 345 to speak to a cruise specialist.